Since the publication of my books I have had a variety of speaking engagements in the UK , the US and Germany. I am available for media interviews and speaking engagements about my story and my three books. I am also experienced in chairing meetings and conferences and participating in panel discussions. Please contact me to discuss any of these events and to book me for your event. 4 May – evening Lecture and Book Signing at Woodmere Community Synagogue, New York. 5 September at 6.00pm – Lecture at Pallant House Gallery, Chichester to link with their exhibition on Grete Marks who is featured in my latest book. There will be a Book Signing afterwards. 1 November at 2.00pm – Sheffield Women’s Lecture Club at the Mercure Hotel, Sheffield. 26 -31 March – Lecture & discussions with students at Vanderbilt University, Nashville, Tennessee. 7 February 2019 – Exeter HMD event. Very successful – Dinner with the Lord Mayor & Consort and good audience for my talk. We sold out of the women’s book and I had the chance to visit the beautiful little Exeter Synagogue – third oldest in the country. An absolute gem. 22 January 2019 – Sir Martin Gilbert Learning Centre at Highgate Synagogue – see entry for Sir Martin Gilbert. I spoke to the Cambridge Jewish Cultural Group at the home of Valerie and Michael Berkson. A good audience and interesting questions. Someone present told me she had been born in the Budapest Ghetto just days before the Liberation. She has promised to send me her story. This was a return visit after a very successful talk in September 2016. I spoke about the women’s book as well as my family’s story. Increased audience of 150 this time. See review: https://www.henleystandard.co.uk/news/literature/131518/coming-through-slaughter.html Though not sure why she said I was ill at ease – I was perfectly happy. A return visit to speak about the new book. I spoke at one of their regular Port Dinners. There was a good audience and some excellent questions. 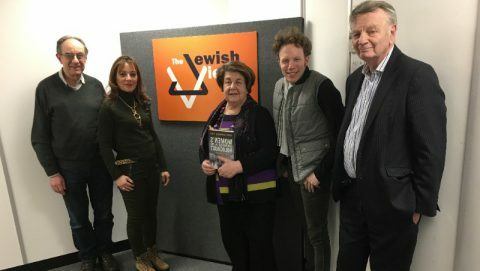 15 March 2018 – I was part of a panel podcast for London’s ‘Jewish Views’ – you can listen to it here. Here I am with my book, Phil Dave, the presenter, and the rest of the panel. I visited several venues in Frankfurt in early October and have been asked to return to the University in Giessen later this year to talk about the new women’s book. A blog on my trip to Germany is now available here. On 20 November 2017 I spoke at Oxford Brookes University (OBU) to the students of Marius Turda’s students studying Racism in the ‘Advances Study in the History of Ideas’ course. The students were very receptive and asked some good questions. One student told Professor Turda that my lecture was the highlight of his time at OBU. What a compliment!!! I spoke to a good audience in the Café at the bookshop – there were some good questions. I spoke to an interested audience at this Home. The audience was very enthusiastic and asked some good questions. I spoke to a good audience in the modern library for Holocaust Memorial Day. Uxbridge seems to have a very good programme of speakers and the audience was very interested and asked some excellent questions. I spoke for Spiro Ark at Hampstead Garden Suburb Synagogue. There was an excellent audience of about 80 people and some great questions. I also sold and signed some books..
29 September 10.30 – Henley Literary Festival. I gave my PowerPoint presentation about my family in the Holocaust and how I came to write my books and the stories in them. My talk was followed by a book signing. Further details from www.henleyliteraryfestival.co.uk . See separate news blog with photos. 5 May 2016 at 7.15 pm- Edgware United Synagogue Yom HaShoah event. I spoke at the synagogue on Thursday 5 May to a good sized audience. Books were available for purchase and signing. 4 May 2016 at 7.00pm – Southend and Westcliff Yom HaShoah event. I was the Keynote speaker at this annual event for the Southend Jewish Community and Guests. Yom HaShoah is the day chosen by the Israeli Knesset in 1951 to mark the Holocaust (Shoah). The date is the 27 of Nisan in the Hebrew calendar which marks the start of the Warsaw Ghetto Uprising in 1943. I was very well received by a large audience and was looked after extremely well by Kevin Leigh with Lunch at a seafront fish restaurant. The Lunch was held at the Royal Medical Society, 1 Wimpole Street, London and afterwards I showed my PowerPoint and spoke about my family’s experience of the Holocaust in Hungary and then how I came to write my books and told some of the stories in my new book ‘Who Betrayed the Jews?’ It was very well received and there were lots of good questions and discussion. After Professor Dan Michman from Yad Vashem spoke about the theme of ‘Don’t Stand By’ I gave my personal perspective as a child of the Holocaust at an HMD event organised for diplomats and embassy staff. After a very jolly dinner where I sat in ‘Queen Mary’s chair’, I spoke to a very full room to a very receptive audience. Apparently the only person to get a larger audience was the US ambassador. On 15 April 2015 I was the keynote speaker at the Synagogue’s annual Yom Ha Shoah ceremony in Weybridge. I was very well received by an audience of around 80 and several books were bought. Holocaust Memorial Day Trust and Picturehouse project for HMD January 2014. I am delighted to say that following 2013’s success with this project for schools, it was repeated in January 2014. I spoke to schools in Brighton (21 Jan.) and Finchley (25 Jan.) at the Phoenix local cinema. If you would like to participate in 2015 contact HMDT for more information. Holocaust Memorial Day Trust Workshop for Members of Local Authorities – 8 October 2013 at 2.00pm. I spoke at the FCO on Whitehall to a very attentive audience and was very well received. A very full hall listened to my presentation and a good discussion followed. Another successful event with good sales. I spoke at the Wiener Library at 29 Russell Square – lots of interest and some good questions. I spoke at the Croydon Civic HMD event at the Town Hall which was well received. As a small girl I used to travel to Croydon on the trolleybus from Sutton to see my Daddy at work in the early 1950s. It was only when I was leaving the Town Hall that I realised it was just round the corner from where my Daddy had his workshop. 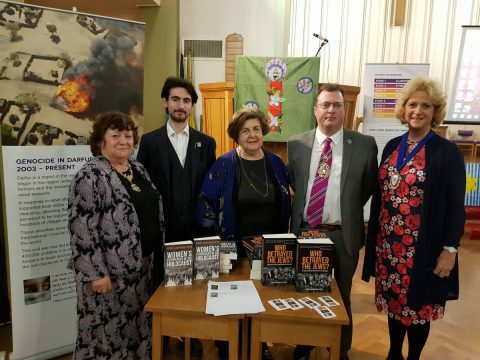 A report of the event with a photo is available at: http://www.thisiscroydontoday.co.uk/Holocaust-survivor-tells-story-Croydon-memorial/story-18022525-detail/story.html#axzz2LR8P8NuU Cllr. and Mrs. Eddy Arram, The Mayor and Lady Mayoress of Croydon with Agnes at the Town Hall. Hammerson House – 21 January 2013 I spoke at the residential care home Hammerson House on 21 January 2013 at 3.00pm. The Holocaust Memorial Day Trust and the Picture House group of cinemas had a joint project for schools at various venues round the country to mark Holocaust Memorial Day 2013. I spoke at a number of venues. One student from the Brixton event said: ‘I enjoyed the session, it was really informative . Listening to Agnes gave the emotional side of things and it was really interesting to hear about the perspective of the Holocaust from someone who was a child at the time and how this has gone onto affect her life’ A teacher from Greenwich said it was the best talk she had ever heard. I spoke to this group on 16 January. My talk was well received with good questions and several people told me interesting family stories which I will follow up. I was delighted to meet up with old friends Barbara and Anthony Nicholls who proposed the vote of thanks and gave me a donation for Jewish Women’s Aid. He revealed our joint hidden past when in 1963 we saw the Beatles perform at Fairfield Halls in Croydon. There was no security in those days and we wandered backstage and met Ringo Starr, George Harrison and John Lennon and I got them to autograph my programme. I think Paul McCartney must have been in the loo because we didn’t see him. Various attempts to get his autograph subsequently have been unsuccessful!! I spoke at the BUPA Care Home Hill House on Elstree Hill South, Elstree, Herts WD6 3DE on 8 February to a mixed audience of residents and guests. The Activities Organiser, Silvia Shillingford had organised the event and my presentation was well received with some buying books which I signed for them. I visited Port Talbot and Neath College, following up my visit in April 2010. I am writing a blog about the trip and it will be posted as soon as possible. I was excited to see the College’s Holocaust Memorial Garden which I opened on my last visit. I was very moved to plant a tree in memory of my maternal grandfather, Armin Klein, who was killed at Auschwitz. In the evening I was at the Cwmbran Stadium, representing the HMD Trustees for the Launch of Wales’ Holocaust Memorial Week which was attended by Carwyn Jones, the First Minister. As part of the build up to HMD 2012, I spoke at Shirley Library with my PowerPoint presentation. The room was packed and there was an interesting Q and A session which concluded with a discussion on what is the best age to tell children about the Holocaust. Named after Arthur Koestler, a Hungarian Jew who was a Holocaust survivor, The Koestler Awards have been running for 49 years and attract about 6,000 entries in different art forms from prisons and probation services across the UK. Each year a selection of these entries is showcased at an exhibition at the Royal Festival Hall, London. Volunteer curators choose the exhibits for the exhibition which are available for sale. This year the curators were 12 magistrates who were chosen from all over the country. I applied after I saw an article in the March 2011 edition of ‘The Magistrate’ – my eye was caught by Koestler’s name as I had researched his book ‘Scum of the Earth’ in which he describes his imprisonment in the dreadful French concentration camp Le Vernet. I was very excited to be one of the 12 magistrates – read my blog about this important and unique project. The Koestler Trust has a video of our curating on its website. I also had a mention in ‘The Daily Telegraph’ with one of my favourite pieces from the exhibition. I was interviewed by Sheila North of Sine FM, a community radio station in Doncaster, on 10 November 2011 at 11.00am. The interview was to mark Remembrance Day on Sheila’s regular book programme ‘Book It’. A podcast is now available http://www.sinefm.com/podcast/show-141.xml. I gave a presentation to the Leeds Jewish Historical Society which was well received. Here is a photo of me signing books with the Chair, Murray Weiner. Signing books at the Leeds Jewish Historical Society 7 November 2011 Photo from Daniel Rose. I was interviewed live by Howard Leader an actor and interviewer who like me loves Edith Piaf and the colour blue. The interview was available on their website Radio Lincolnshire and we will replace it shortly on the website. BBC World Service interview – 14 August 2011. My interest in antiques led to me being a contestant in BBC2′s quiz ‘Antiques Master 2011′. My heat was filmed in March at the historic Town Hall in Burnley with antiques expert Eric Knowles and Sandi Toksvig. The programme was shown on 18 July at 8.30pm. I was disappointed with my performance particularly with the Derby porcelain but they did not ask me about the items I actually collect. Thanks to every one who contacted me to comment on the programme and particularly the wonderful man outside Swiss Cottage Underground station last night (19 July) who made my day by accosting me and saying the magic words ‘weren’t you on television last night? 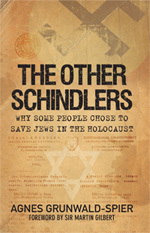 Click the link http://www.bbc.co.uk/programmes/b012svr9#synopsis Sandi has written a book for children called ‘Hitler’s Canary’ about the impact of the German invasion of Denmark with particular reference to her father who was a young boy at the time and the family’s involvement in the rescue of the Danish Jews. Sutton High School for Girls – GDST: 14 May 2011 I attended Sutton High School (GDST) in Surrey 1955-63. I was taught History by Miss Lucy Clarke who was a charismatic teacher and much loved by her pupils. There is an acknowledgement of Miss Clarke’s influence on page 12 of ‘The Other Schindlers’. On 14 May, at the Old Girls’ Day, I presented a copy of my book to the School Library where as a young girl I spent many happy hours. I particularly remember pouring over the old bound copies of Punch from the Victorians and how much knowledge of that period I learnt came from that journal and its wonderful cartoons. They gave a refugee child an invaluable insight into England and its ways. Friends Meeting House, Euston Road, London: 24 November 2010 I was invited to speak at the Quakers Meeting House on Euston Road. Bertha Bracey, the Quaker woman that I wrote about in my book and proposed for recognition as a British Hero of the Holocaust, is honoured there by a sculpture. It was created by Naomi Blake, one of the Kinder saved by the Kindertransport which Bertha did so much to create. Be sheer coincidence, David Clark, one of the people at that talk, was amazed to find a photograph of his Grandfather, Siegmund Weltlinger, in my book (Plate 36). David has been able to give me much more information about his grandparents’ experiences in hiding in Berlin throughout WW2 and this information appears in the Postscript to the paperback edition which is due out in August 2011. Interview on Radio 4’s ‘Sunday Programme’, 8 August 2010 I was surprised at how many people heard the interview with William Crawley early on Sunday morning which was well received. ‘Conversation’ at the Jewish Museum with Henry Grunwald QC, 25 July 2010. I was delighted to be invited to the Jewish Museum for a most enjoyable ‘conversation’ about my book with Henry Grunwald who is a colleague from the Holocaust Memorial Day Trust and a former President of the Board of Deputies of British Jews. Channel 4’s ‘Five O’Clock Show’ – Interview with Fern Britton, 21 July 2010. I thoroughly enjoyed my first experience of appearing on TV. On the show Fern Britton was well prepared, having obviously read the book and asked me thoughtful questions. She held it up to the camera several times and everyone looked after me very well. Sheffield Book Launch at the Cutlers’ Hall, Sheffield 12 July 2010 The Company of Cutlers in Hallamshire is one of the few livery companies outside London. The Master Cutler, James Newman, generously hosted a Book Launch for me at the Cutlers Hall on 12 July 2010. It was serendipity that the publication of my book coincided with James being the first Jewish Master Cutler since the office was created in 1624. London Book Launch at the Board of Deputies, 9 June 2010. Thanks to the kindness of the President, Vivian Wineman, I was able to hold my London Book Launch at the Board of Deputies. With a background of Klezmer clarinet music my three sons, several colleagues and friends came to support me and buy books which I signed. My commissioning editor, Simon Hamlet, from The History Press spoke about the book. Vivian Wineman and I also said a few words. Gordon Gibb, an architect colleague, took some wonderful photos displayed on this website and several of my informants were able to be present. It was a splendid launch for my book. © 2011-2019, Agnes Grunwald-Spier, all rights reserved. A web creation by lbdesign.